The consensus for anthropogenic climate change AND the safety of GMOs can best be defined as “overwhelming.” I find it ironic that many who think (without evidence) that GMOs are dangerous also think that climate change is real. And to be fair, there are others who do the opposite. There are groups on Facebook who ridicule every anti-GMO claim, yet, in the very next sentence deny the fact of climate change. Some of the deniers do so out of political expediency. There is a general belief, though not supported by data, that the left wing accepts climate change but denies the safety of GMOs. And generally, there is a feeling that the right wing accepts GMO safety but denies climate change. The fact is the scientific evidence, produced in massive quantities, support the positions that humans have caused climate change and that GMOs are safe to humans and to the environment. Now watch what happens. Someone will cherry pick one peer-reviewed study that assaults these consensuses (wow, that’s the plural? 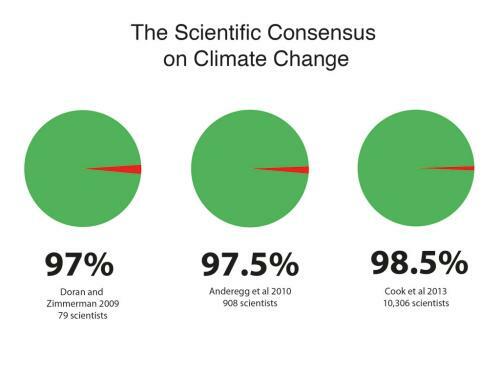 )–then this “someone” will now claim that the consensus doesn’t exist. Or they will claim the consensus of some non-mainstream organization, which uses the non-scientific method of creating an a priori conclusion then attempt to find the evidence that supports that, is more important. The only thing we can do to find a consensus is to look at the broad body of evidence, and state, “this is what we know.” Yes, the consensus can change. But that is rare, and when it does, it’s because of scientific evidence. It is simply an argument from ignorance to claim that because we don’t have all the evidence it is possible that the consensus is wrong. It doesn’t work that way. Editor’s note – this article was first published in 2015. It’s been updated to include new links and improved the layout.